China’s policymakers may not be too sorry, for once, to see the yuan hit its highest value against the U.S. dollar since 1993. This week alone has seen the currency rise 0.7% against the greenback, its largest weekly jump in four years. By the standards that Beijing has imposed on the tight management of its currency, and its resolute opposition to letting the yuan appreciate except to its own timetable, it is a dramatic rise. Long-term, it has always been in China’s interest (and policymakers’ plans) to let the currency appreciate towards market-driven levels in order to support the effort to reorient the economy away from export-led growth and towards domestic consumption. 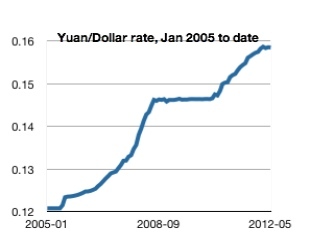 But a number of short-term factors have come together to make a stronger yuan desirable now. It will help in the fight against inflation, which hit a three year high of 6.5% in July. It will slow the accumulation of dollar-denominated foreign-exchange reserves at a time when Chinese officials worry about the erosion of the their value in the face of the U.S. deficit debacle, and July’s trade surplus, the largest in two years, will swell them further. It, up to a point, would also pre-empt further inflationary impact on China of a further round of quantitative easing in the U.S., should the U.S. Federal Reserve may good on some hints that that might be necessary if U.S. GDP growth remains tepid, and, even more intangibly, it stocks up some international goodwill for Beijing as it makes China look to be a responsible team player in the face of a potential ‘double-dip’ global economic slowdown. Most important of all, as far as the internal debate on the currency goes, appreciation would not be happening in the face of foreign, particularly U.S., pressure to let it happen. Whether there is a fundamental shift towards liberalizing China’s exchange rate policy about to happen, or, as seems more likely to us, a cautious step in that direction through, say, widening the bands within which the yuan is allowed to fluctuate each day, it won’t come without some cost to the rest of the world. The dollar, by definition, would fall and U.S. Treasury yields rise, if not disruptively; China would export some of its inflation. Many of these effects would, of course, net out across the global economy, such is the arithmetic of current accounts. How smoothly that would go depends as much as anything on what progress China can make in liberalizing its domestic financial markets. That is the biggest missing piece in making the arithmetic of canceling out the global imbalances work out. There was nothing new of substance in Vice-Foreign Minister Cui Tiankai’s briefing ahead of the G-20 summit in Seoul, but this Bystander couldn’t help but allow himself a wry smile at Cui’s criticism of a U.S. proposal to set current-account targets at the meeting. “The artificial setting of a numerical target cannot but remind us of the days of planned economies,” Cui said (via Reuters), and we assume he knows of what he speaks. Cui, who is one of China’s main negotiators at the G-20, also brushed aside suggestions that a target should be set for the Chinese currency’s appreciation. “That would indeed be asking us to manipulate the renminbi’s exchange rate, and it is something that we will of course not do.” Quite. Strengthen multilateral cooperation to promote external sustainability and pursue the full range of policies conducive to reducing excessive imbalances and maintaining current account imbalances at sustainable levels. Persistently large imbalances, assessed against indicative guidelines to be agreed, would warrant an assessment of their nature and the root causes of impediments to adjustment as part of the Mutual Assessment Process, recognizing the need to take into account national or regional circumstances, including large commodity producers. To support our efforts toward meeting these commitments, we call on the [International Monetary Fund] to provide an assessment as part of the MAP on the progress toward external sustainability and the consistency of fiscal, monetary, financial sector, structural, exchange rate and other policies. In other words, the U.S. will cut its deficits and China will increase domestic demand to reduce its surpluses allowing the yuan continue to appreciate against the dollar. Which is actually what needs to happen and both countries would like to happen, just not their part yet. By making the IMF the cop on this particular beat and not setting any specific targets for it to police to, it is a fair bet that none of this will happen anytime soon. G-20 leaders meeting next month in Seoul might change that, but we doubt it. 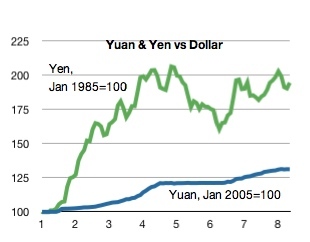 Meanwhile, the U.S. will be able to continue its dollar devaluation against currencies that move freely through a second round of quantitative easing (we expect the U.S. Federal Reserve to launch its QE2 next week) while China will let the yuan appreciate only gradually against the dollar and keep racking up its surpluses while it resolves its internal political differences over making the reforms necessary to make the economy more domestic-demand driven, a project that will require multiple five-year plans. We never said the high road goes anywhere, at least for a long while.